It was in a central location and was handy for shops, bars and restaurants. The apartment was spacious and clean. 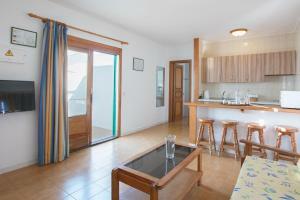 It's an excellent location with a very short walk to the beach, shops and restaurants. We went to La Boheme restaurant on our first night and had the most amazing steak. Each night after we tried different restaurants in the square behind the apartment block e.g. Namaste Indian and various Italian restaurants. We didn't have one complaint in any restaurant that we visited. Food, service and surroundings were excellent. Costa Teguise was very clean with no litter and the apartment block was very secure. Rent a bike for €10 per day and cycle along the coast to Arrecife. A short walk to the beach and plenty of nice bars and restaurants for breakfast, lunch or dinner. Very clean and modern. We were in the upgraded 214. There are a couple of FB groups for Costa Teguise if anyone needs local info. The position is the biggest asset near all bars and restaurants. Had stayed many times at this property before, nothing unexpected. Excellent location. Very friendly staff. Apartments were clean but a bit tired. Lovely pool. 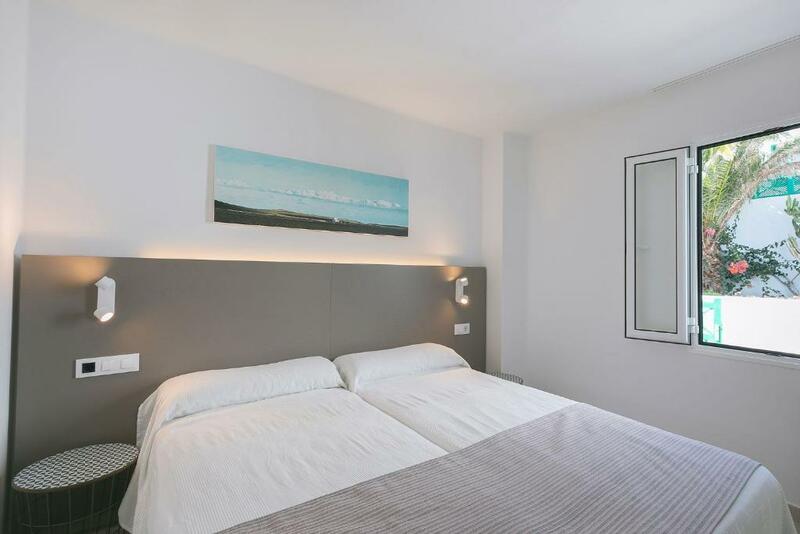 Apartamentos Celeste This rating is a reflection of how the property compares to the industry standard when it comes to price, facilities and services available. It's based on a self-evaluation by the property. Use this rating to help choose your stay! 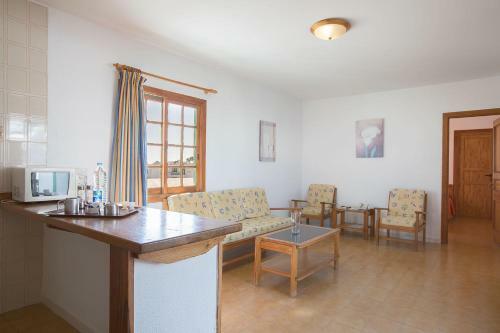 Enjoy the year-round sunshine of Lanzarote with a stay in these charming, traditional-style apartments, set just 250 feet from the famous beaches of Costa Teguise. 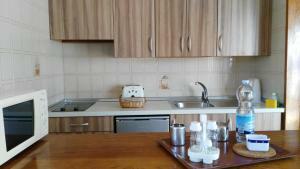 Self-catering apartments feature a 32-inch flat-screen TV with free international channels. All offer well-equipped kitchenettes and their own sun terraces. Some offer views of the sea. The whitewashed buildings of Apartments Celeste are located 3 minutes´ walk from the sandy beach of Las Cucharas, on Lanzarote’s well-known Costa Teguise. You will find a great selection of bars and restaurants within 100 feet of the apartments. Costa Teguise Golf Club is 5 minutes by car and Lanzarote Airport is 8.7 mi away. This property also has one of the top-rated locations in Costa Teguise! Guests are happier about it compared to other properties in the area. When would you like to stay at Apartamentos Celeste? This beach-style apartment features a double or twin bedroom. It has a living-dining room with a sofa and satellite TV and a private balcony or terrace. The kitchenette has a microwave, coffee maker, toaster and hob. 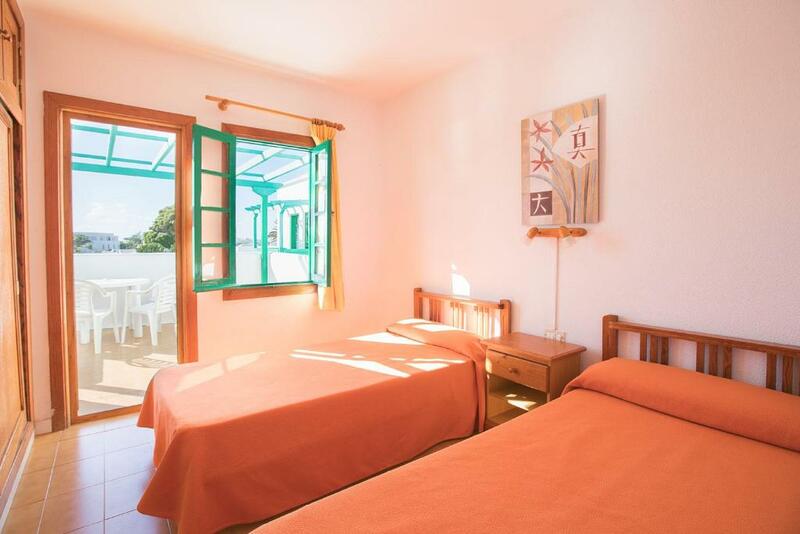 This beach-style apartment features a double and a twin bedroom, or 2 twins. It has a living-dining room with a sofa and satellite TV and a private balcony or terrace. The kitchenette has a microwave, coffee maker, toaster and hob. Apartamentos Celeste esta dividido en 3 bloques independientes con edificios de 2 plantas y típica arquitectura canaria. Se accede a los bloques a través de una verja principal. Es muy seguro. El tercer bloque es solo para adultos. Nuestro personal lleva años trabajando en Celeste por lo que conocemos personalmente a muchos de nuestros clientes desde hace tiempo, lo que crea un vínculo muy cercano entre ambos. 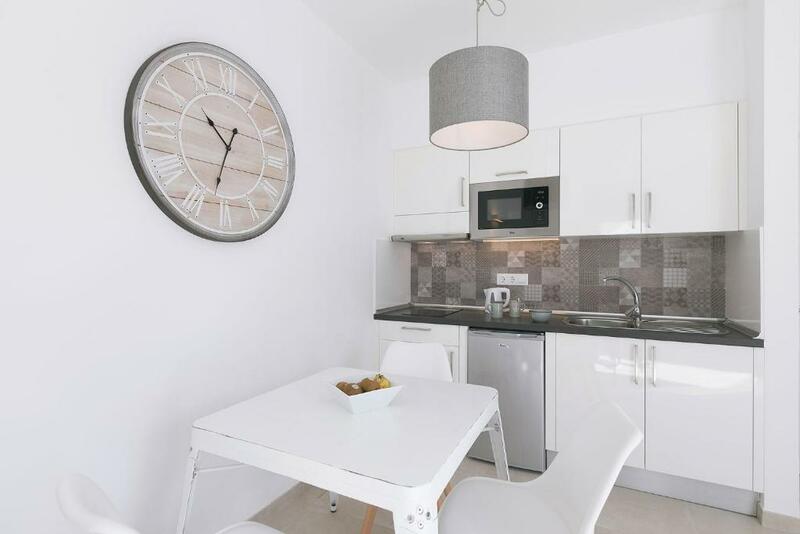 Apartamentos Celeste tiene la mejor localización de Costa Teguise, en el mismo corazón de la localidad junto a la playa principal de Las Cucharas y el Pueblo Marinero con sus bares, restaurantes, tiendas y mercadillos. House Rules Apartamentos Celeste takes special requests – add in the next step! Apartamentos Celeste accepts these cards and reserves the right to temporarily hold an amount prior to arrival. Before travel, all guests must inform the property of their flight number and anticipated time of arrival. This can be noted in the Comments box when booking, or by contacting the property directly using the contact details which appear on the Booking Confirmation issued by this site. Please note that the total amount will be charged upon arrival. Please inform Apartamentos Celeste of your expected arrival time in advance. You can use the Special Requests box when booking, or contact the property directly using the contact details in your confirmation. The apartment although very large was quite dated. A small dressing table or chest in each bedroom would be good. The bathrooms are also quite dated. There was quite a bad smell from the sewage system in the bathroom. 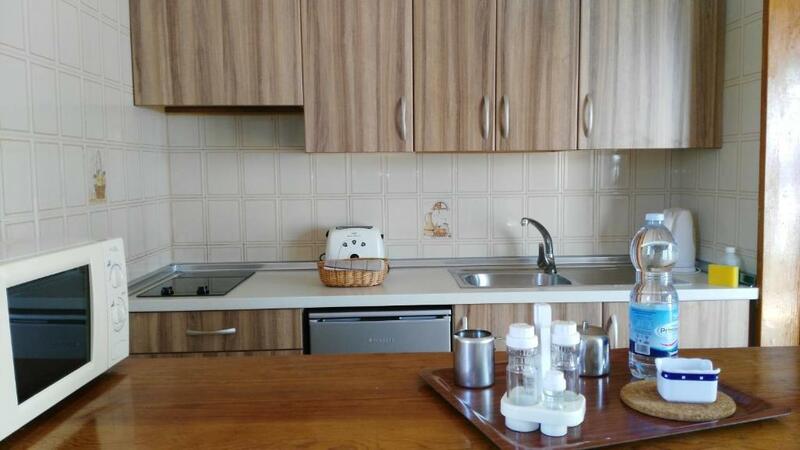 The worktop on the breakfast bar needs a new top as it's scratched and paint peeling. Trivial complaints really as it was incredibly good value for 1 week. Beds and umbrellas on the beach were pricey at €4 each per day. The apartments were below basic. Bathrooms were filthy, ground in dirt, bed spread had old blood stains on it, sofa extremely uncomfortable, bed itself also uncomfortable. When you filled the sink in the bathroom it was leaking out from underneath all over the bathroom floor. Spoke to Barbara with regards to the apartment and asked could we move to another, her answer was no. Her attitude towards paying guests wasn’t professional. She didn’t want to help at all. no room WI FI. apartments desperately need refurb. location is fine. staff were excellent. The rooms are in need of refurbishment they are looking grubby and nighttime in March are cold! The furniture within the flat wasn’t very comfortable or practical. There was ants. The external door was not easy to access. You have to pay quite a lot for extra amenities. Not always cleaned on a daily basis. Windows were old and had gaps in them. Location. Light and airy appartment. only one thing . i think the bathroom need a little upgrade because the hot water runs out so fast . nice helpful staff. beds are comfortable . good housekeeping . wonderful location next to the beach , close to restaurants and bars . The apartments are very tired and need updating. The doors and windows did not shut properly and the shower was just a trickle!!! These problems did not affect our enjoyment and we would go back....but hope for a better apartment!!! The location was excellent and the pool areas were peaceful. The 2 bedroom apts have very large sun terraces. In addition our 2 bedroom apt also had 2 balconies.